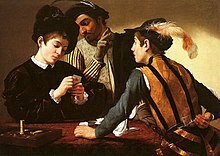 The Cardsharps (c. 1594), by Caravaggio. [n 1] The painting depicts two cardsharps, one with hidden playing cards tucked into the back of his belt (right), and the other peering over the shoulder of the wealthy person being duped and signalling his cards to the first person (centre). card +‎ sharp (“cheater, dishonest person”). (card games) A professional cheater at card games. One of Tim’s great-grandparents had been a cardsharp in the wild west, and had been shot dead during a game. While thus running on, the knavish card-sharp was slowly, and with apparent fairness, cutting the pack, which was prepared by having every card but the honours of each suit cut at the ends, in so slight a degree, however, as not to shorten them enough to be detectible by an ordinary eye, though sufficiently to be felt by a fine and pracised finger, which could thus ensure a court-card, while the red cards of the pack (or deck of cards, as they were then commonly called) were deprived of their proper size by a similar process of shaving off the sides, so as to make the turn-up either red or black at will of the player. Whenever we used to want to take a rise out o' Bill after, we only had to ax him if he'd seen any more card sharps, and he'd get as mad as a hatter. The cleverest card[-]sharp we ever saw—outside of good society—was a Greek by country as well as by profession; but all the money he picked up in the by-ways of the sporting world went at the hazard-table, and the poor rogue often wanted a dinner. You'd been running with a gang of card-sharps when I picked you up, and the police were waiting their chance to gaol you. When the businessmen quit, there had been two other men eager to take their chairs. The ranchers were somewhat leery about allowing strangers to join their game. They had been suckered in by a slick cardsharp once and had learned a lesson that still galled them whenever they were reminded of it. ^ From the collection of the Kimbell Art Museum in Fort Worth, Texas, USA. ⁠ , Oxford: Oxford University Press, 1913.